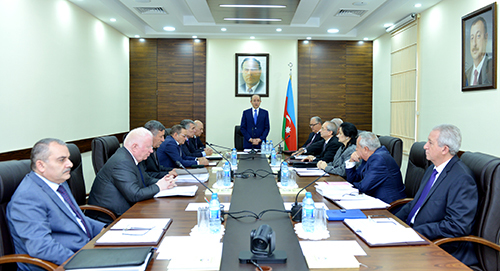 The following meeting of Judicial-Legal Council was held. Making a speech at the meeting, Chairman of the Council and the Minister of Justice Fikrat Mammadov noted great significance of referendum that was held at the high level of democratic standarts last month, in terms of the future development of Azerbaijan, more reliable ensuring of human rights and improvement of public administration. Significantly stressed that the adoption of Referendum Act on the amendments to Constitution with civil solidarity, is the next manifestation of trust and public confidence to the head of state Ilham Aliyev. It was noted that the amendments to Constitution would give its positive contribution to the activity of judiciary, as well as the removal of age limit for judge candidates would create conditions for broad representation of the young in judiciary. As well as, measures on the improvement of legislation that regulating judicial activity by taking into account recommendations of high-level international organizations and staffing judicial vacancies were discussed and other organizational issues were reviewed at the meeting. At the same time, hearing disciplinary proceedings against judges, decision was made on the judge of Baku city Yasamal District Court Akshin Efendiyev to be dismissed and transferred to another court and the judge of Sumgayit city Court Ilyas Mahmudov and the judge of Zagatala district Court Arif Ismayilov to be reprimanded for gross violations of law and for offences conductive to corruption. One disciplinary proceeding was initiated against a judge for serious shortcomings as well as, procrastination causing citizens justified dissatisfaction.